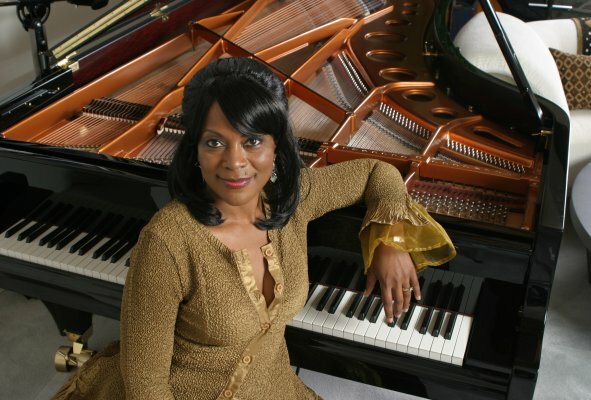 “Queen Of The Keyboards”, “The Complete Package”, The“Triple Threat” are just a few titles that have been often used to describe Bay Area keyboardist and vocalist, #Janice Maxie-Reid.Conservatory-trained, jazz and gospel inspired, this stunning and talented powerhouse hails from Oakland California. Janice began playing at the piano at age four, singing at age nine and performing at the professional level with bands at the age of thirteen. She impressively shifts through all genres from classical to spirituals, blues to gospel and funk to jazz. A “one-woman band”, Janice often doubles as a #keyboard and left-hand keyboard bass player which makes her a force of nature on any stage! Her soulful, angelic and daringly accurate vocal prowess, distinctive four-octave voice range and engaging stage presence captivate her audiences! Janice’s vast musical gifts and massive repertoire are always on point and leave her audiences wanting for more! Janice has performed on major #concert stages including Bourbon Street Music Club in Sao Paulo, Brazil, Saratoga Spring Performing Arts Center, Davies Symphony Hall, Concord Pavilion,#Yoshi’s and the legendary Berkeley and #Russian River Jazz #Festivals. Previous Post EXCLUSIVE INTERVIEW **JAZZ ICON DOUG CARN COMING JANUARY 25 ! !